Tehran is drumming up an oral war of attrition against Israel as a ruse to deter the IDF from striking the military hardware and personnel flowing into Syria. Iran is pouring out violent threats in a rising crescendo against the Jewish state for two goals: One is to keep Israel off-balance and frozen in a high defense posture on its northern borders; and two, to con Israel into fearing that any IDF action would tip over into an all-out conflict. This stratagem allows Tehran to keep up a continuous stream of hardware and personnel into Syria and Lebanon free of hindrance by Israel’s air force and missiles, and so anchor its military presence in both of Israel’s northern neighbors. The missile strike conducted by the US, the UK and France on Syrian chemical sites on April 14 was a letdown. And also, against expectations, the Western attack avoided Iranian targets, although Hizballah and other pro-Iranian forces played a central role in the Syrian conquest of East Ghouta and its use of chemical weapons. Saudi sources put out a report on Friday alleging that 15 Iranian officers were killed in the missile strike. There are no grounds for this report and it appears to have been designed for home consumption. President Donald Trump repeatedly asserts that he is determined to pull American troops out of Syria as soon as possible. This gift is a boon for Tehran’s goals. It will remove the main obstacle, a US military presence along the Syrian-Iraq border, that impedes the transfer of pro-Iranian Shiite militias from Iraq into Syria and the creation of a continuous land bridge from Tehran to the Mediterranean. In celebration of its effortless gain, reports appeared on Saturday that Iran, Iraq and Syria had undersigned a project for building a 1,700km highway from Tehran to Damascus via Baghdad that will be ready for traffic in two years. Moscow and Jerusalem are at loggerheads over Syria after a long period of amity. Tehran has taken note of President Vladimir Putin’s recent warning to Israel that its air force operations in Syria would no longer have the freedom previously enjoyed. 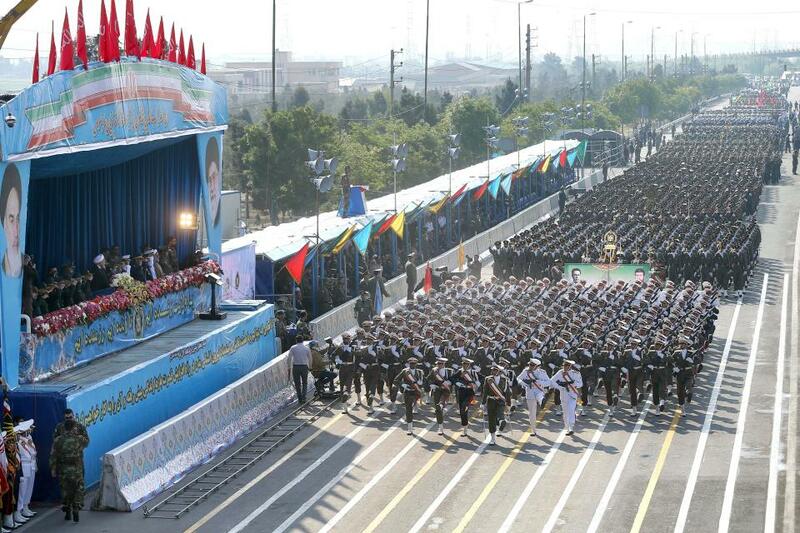 Putin has therefore removed another big obstacle from Tehran’s goals. Iran will make every effort to deepen the rift. For all these reasons, Prime Minister Binyamin Netanyahu and Defense Minister Avigdor Lieberman cannot be satisfied with their protestations of the IDF’s readiness and willingness to pick up the gauntlet against any threat. Tehran’s belligerent rhetoric is a cover for an action which Israel’s leaders have vowed to prevent. This can’t be done by talk alone. Trump’s direct and unscripted question to Israel’s leader shocked advisors present for the call. In a telephone call last year, US President Donald Trump bluntly asked Prime Minister Benjamin Netanyahu whether he is genuinely interested in peace with the Palestinians, Axios reported Sunday. The question, which shocked those in the room, came in the midst of a longer, and largely friendly, conversation between the two leaders. According to three sources familiar with the call, Trump had recently read news reports stating that Netanyahu was planning to expand Jewish settlement construction to shore up support among his right-wing base. The president believed such a move would unnecessarily anger the Palestinian leadership and endanger his much-tauted “deal of the century” to solve the Israeli-Palestinian conflict. The report does not record Netanyahu’s answer to Trump’s direct query. “The president has an extremely close and candid relationship with the prime minister of Israel and appreciates his strong efforts to enhance the cause of peace in the face of numerous challenges,” a senior White House official responded to the Axios article. “The president has great relationships with a number of foreign leaders but that doesn’t mean he can’t be aggressive when it comes to negotiating what’s best for America,” added White House Press Secretary Sarah Sanders. The revelation of the unvarnished exchange between the two leaders comes only a month before the implementation of Trump’s controversial decision to move the American embassy in Israel from Tel Aviv to Jerusalem, according to a recent State Department press release. The new embassy will open in May, to “coincide with Israel’s 70th anniversary,” the press release states. The embassy will be located in the building that now houses the US Consulate General, in Jerusalem’s Arnona neighborhood. “This is a great day for the people of Israel,” Netanyahu said in a statement issued by the Israeli embassy in Washington. “President Trump’s decision to move the United States Embassy to Jerusalem on the coming Independence Day follows his historic declaration in December to recognize Jerusalem as Israel’s capital. This decision will turn Israel’s 70th Independence Day into an even bigger celebration. Thank you President Trump for your leadership and friendship. Trump’s decision to move the American embassy came on the heels of his December announcement that the United States officially recognized Jerusalem as Israel’s capital. The Palestinian response to the upcoming embassy relocation was swift. The move showed a “determination to violate international law, destroy the two-state solution and provoke the feelings of the Palestinian people as well as of all Arabs, Muslims and Christians around the globe,” said Saeb Erekat, the chief Palestinian negotiator, in a February interview with Reuters. “Trump and his team have disqualified the US from being part of the solution between Israelis and Palestinians; rather, the world now sees that they are part of the problem,” Erekat said. Iran’s foreign minister made the point more dramatically, warning that if Trump quits the 2015 accord, Tehran may respond by relaunching and intensifying its now-blocked nuclear program. Iranian Foreign Minister Mohammad Javad Zarif, who helped negotiate the nuclear deal, said on CBS’ “Face the Nation” that Iran might consider “resuming at a much greater speed” its nuclear activities. “Obviously the rest of the world cannot ask us to unilaterally and one-sidedly implement a deal that has already been broken,” Zarif said. Trump has vowed to scrap the 2015 Iran accord unless co-signatories France, Germany and Britain can “fix” it. Unless revisions are made, he has vowed not to sign another waiver of U.S. sanctions on May 12, the next deadline, potentially wrecking the deal. Trump also is hoping to meet with North Korean leader Kim Jong Un by mid-June in a push to roll back the country’s growing nuclear arsenal. On Sunday, Trump uncharacteristically sought to downplay expectations of the proposed summit. “Only time will tell,” he tweeted. U.S. and European diplomats have been brainstorming ways to address some of Trump’s concerns, including Iran’s production of ballistic missiles and its support for militant groups elsewhere in the Middle East — issues that were never tied to the nuclear deal. But the diplomats still are not “across the finish line,” a senior administration official told reporters Friday. “We have a very special relationship because both of us are probably the maverick of the systems on both sides,” Macron said Sunday. Macron “has broken the code when it comes to dealing with President Trump,” said Heather Conley, director of the Europe program at the Center for Strategic and International Studies, a nonpartisan Washington think tank. “He has been, I think, the most successful in trying to convince the president to think through some very important issues … to France and to the European Union,” Conley added. Trump’s relationship with Merkel has been less warm. Unlike in France, which has a semi-presidential system, Germany’s chancellor is not directly elected, so Europe’s longest-serving elected leader must act through compromise and coalition, messy concepts for Trump. After the Iranian nuclear deal, trade will top Merkel’s agenda. She, Macron and other European leaders often express frustration that Trump, in his emphasis on bilateral trade agreements, displays a misunderstanding of how the European Union works. Macron will get Trump’s first official state dinner, a formal affair Tuesday night at the White House. The Trumps also will dine with Macron and his wife, Brigitte, on Monday night in private at Mount Vernon in Virginia, the plantation home of George Washington, and Macron will lay a wreath at Arlington National Cemetery. Most significant, perhaps, he will address a joint session of Congress on Wednesday, a rare honor. Invited by Republican congressional leadership, Macron will speak on the anniversary of President Charles de Gaulle’s historic speech to Congress in 1960. Unlike Macron, the staid Merkel has never really gotten along with Trump. He openly mocked her on Germany’s decision to accept refugees flowing out of Syria. Some of Trump’s major objections are time limits on some restrictions in the deal, so-called sunset clauses. Iranian travelers stand in front of a currency exchange in Tehran, hoping to exchange money on April 11. A nationwide dollar-buying panic is in full swing, spurred by the plunging value of the Iranian rial, a sluggish economy, and fears that the United States will reimpose crippling sanctions on the Islamic republic. With the rial hitting all-time lows, the government has imposed an official exchange rate of 42,000 rials against the dollar, set a cap on the amount of foreign currency that citizens can hold outside banks, and sent police to patrol exchange shops to ensure that no under-the-table currency trading is going on. But economists say the new currency measures will be difficult to maintain. Exchangers are hoarding U.S. dollars, and Iranians who require foreign hard currency for business or travel are already defying the government and turning to the black market, where the rate has skyrocketed. The businessman said exchange offices had U.S. dollars to sell, but would not do so for the government’s set rate of 42,000 rials. Instead, he said, exchangers were still selling dollars for free-market exchange rates, despite Tehran’s warning that those caught trading foreign currency outside official rates would face arrest. 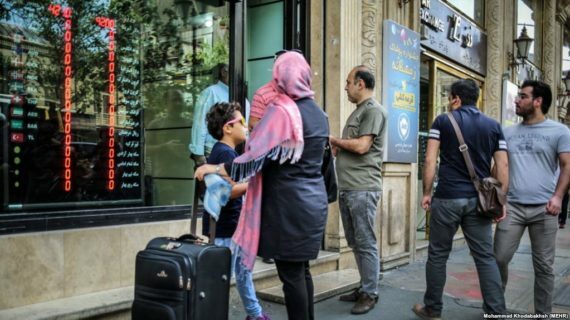 The new measures are affecting Iranians who study, travel, or do business abroad, as well as those who keep their savings in dollars. Police patrol exchange shops to ensure that no under-the-table currency trading is going on. President Hassan Rohani, who was elected to a second term in 2017 on pledges to boost jobs and the recession-hit economy, has been under fire. In January, grievances against the government spilled over into antigovernment protests across Iran. The demonstrations were crushed, leaving at least 25 people dead. Iran’s currency has lost close to half its value on the free market since September, when the dollar was at 36,000 rials. The currency hit a record low of 60,000 on the free market last week. Iran has been unable to reap the full benefits of the 2015 nuclear deal with world powers — under which Tehran curbed its contentious nuclear program in exchange for sanctions relief. This is partly due to resistance among Iran’s hard-line conservative camp to opening up the state-controlled economy, residual U.S. sanctions linked to Iran’s human rights record and ballistic-missile program, and European companies’ continued wariness of investing in Iran because of fears of U.S. penalties. Economists say this has severely affected Iran’s access to trading relationships, finance, and foreign investment. The spiraling currency has also been driven by fears of a return of crippling sanctions if U.S. President Donald Trump carries out his threat to exit the nuclear deal with Tehran. Iran has long had trouble managing its currency market. In 2012, the government tried to set an official, single, rate for the currency, but the attempt failed. The head of Iran’s central bank, Valiollah Seif, was met with angry objections and interruptions from lawmakers in parliament last week, with many demanding his resignation. Seif blamed the plunging value of the rial on “lack of certainty” about the future and said that “enemies know the issue and try to use any opportunity” to create trouble for Iran. He also referred to “traces of plotting” by regional rivals, including Saudi Arabia and the United Arab Emirates, without elaborating. Vice President Eshagh Jahangiri blamed “noneconomic, unjustified, and unpredictable factors” for the rial’s collapse, given that he said the country’s exports were performing strongly. “There should not be such incidents in an economy that always has a surplus of foreign currency. Some say interference by foreign hands is disrupting the economic climate and some say domestic machinations are spurring these things in order to destabilize the climate in the country,” Jahangiri added.